At Hackness Grange we take the needs and equal treatment of all our guests extremely seriously. We are committed to ensuring our facilities and services are accessible to all. If during your stay you feel there is something we could do to assist you, or make your stay more comfortable, please allow us the opportunity to do so by contacting Reception. Disabled parking which is signposted on arrival at the grounds of the hotel is designated to the front of the main building. There is also signage to a ramp for those guests in a wheel chair for easy access into the main building. For those guests who can manage the stairs, there is a sturdy handrail to use if needed. Guests that need assistance on arrival can ring 01723 882037 when you arrive so that a member of staff can come and help you and bring in your luggage. There is a hearing loop installed at reception, please set your hearing aid to ‘T’. There are also seats opposite reception that guests can take advantage of. Clipboards are available to assist any guests who have difficulty accessing the Reception desk. Guests are advised to inform Reception at check in if they will require any assistance in the event of a fire evacuation. In the event of the fire-alarm sounding staff will immediately enter your room to assist you out. We have cutlery available for guests with dexterity issues. Please ask reception to ensure that we have it made available for your stay. We also can serve drinks in straight glasses if requested. Staff will also arrange suitable passage to a pre-booked table prior to your meal so as ensuring minimal disturbance to any guest. 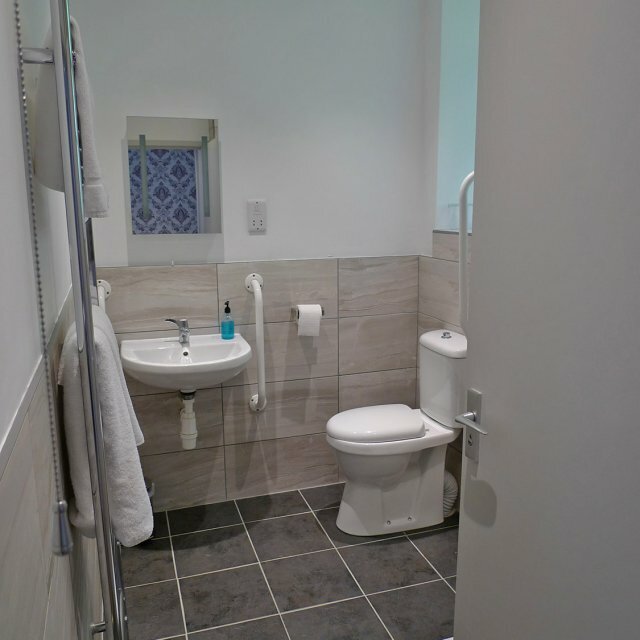 Our disabled toilet in the main house is only suitable for an ambulant wheel chair user or a manual wheel chair user. Room 26 is suitable for ambulant and manual wheel chair users. 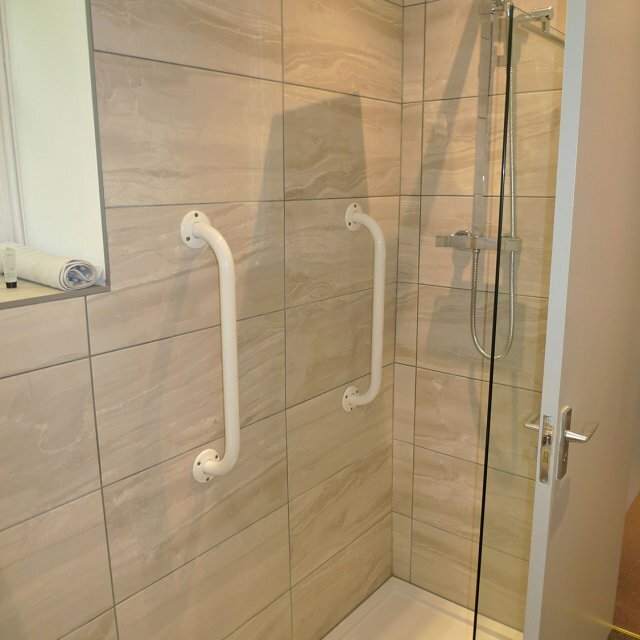 Whilst the bathroom has a ‘walk-in’ type shower with grab rails, it is not a wet-room. The route to the room is over pavia and there is a ramp up into the corridor with easy access from the corridor into the room. There are no steps either into the room or once in the room. Room 27 has one step from outside into the room and is then level. It has a walk-in shower cubicle that requires one small step u into it. The flooring in the bedrooms is short pile carpet. Televisions with a remote control are provided in all bedrooms. These televisions have the facility to display subtitles. Room 26 bathroom is fitted with accessible sinks, with lever taps. Soap is provided in soap dispensers. Bathroom floors are using floor tiles. Assistance dogs are welcome in the hotel and are granted access to all public areas. Should you require any assistance please let reception know who will endeavour to do all they can to make your stay with us as enjoyable as possible.